Posted: June 9, 2014 in The County, What the hell? I was calmly reading my email when i discovered that I had been invited to a media event regarding this particular restaurant in West County of all places. After thinking about it thoroughly, I came to the conclusion that as I do love steak and I do love seafood…I realized I would be a fool to pass on this opportunity. Thankfully, I’m pleased this was the route I took. As long time readers will certainly realize, there is nothing about J. Gilberts in and of itself that would have drawn me in. 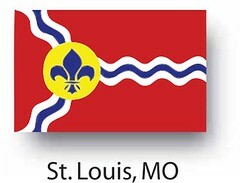 Obviously, it’s not in St. Louis City. It’s a corporate chain. It’s also in a mall. Welcome back to Fish Fry Nomading for the advanced learner. 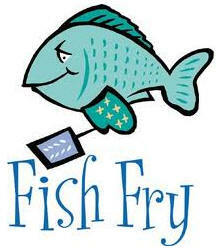 Hopefully, by now, everyone has heard the report Rachel Lippman did on 90.7 KWMU celebrating St. Louis Fish Frys. Yes that was me in the second segment of the story. It was a great honor to be chosen as someone to be a part of St. Louis Fish Frys and why those of us who aren’t even Catholic attend them. I certainly hope everybody who does do the fish fry thing approves of the silly things I said and that we’re all still good, because sometimes it’s hard to be an expert on things that you just kind of do for yourself. They have a nice sign. Once again our multi-generational clan is off for another few moments spent in each other’s company, in fellowship, and surrounded by fried fish which we pretend is healthy. At least some of us do. Again, we find ourselves hitting up a rerun fry, but considering how much we loved this one back in the day, it did not really strike me as a negative. For the past couple seasons, I had been talking about going back anyway. 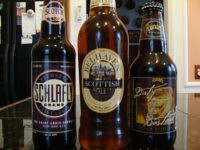 As a beer fan, one of the things I’d really loved about this place was the selection of Polish beers they had. 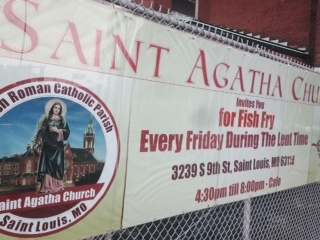 We were intending to hit a new place this week, but due to some travel concerns and the patriarch of the family arriving late and without his car, we chose to re-visit St. Agatha’s because my in-laws had not sampled their cuisine when our nuclear family went on our very first fish fry. Like the turning of the seasons, every year we must make our way to St. Stephen’s Protomartyr on Wilmington Avenue, just off of Super South Grand. As far as I can recall, and I have not checked, we have arrived inside their halls every single Lenten season that we have been doing this as a family. My Mother-in-law always brings her coupons. I always rave about this place. It’s just pretty much a staple now, so yes, next year we’ll be going back I’m sure. This year we had an interesting tag along that should be apparent sooner or later, but I’m not going to divulge it just yet, because it makes me feel important to know something. Welcome back! How was your winter? 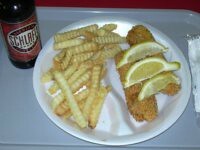 This is the first post of our fifth year of blogging the Lenten Fish Frys in the St. Louis Area. First of all, I’d like extend a very warm thank you to the people who continue to read about my silly food adventures. There are a few more slingers that I’m interested in eating, but I think this blog, aside from the Fish Frys, may go into new directions! Also, please feel free to keep up with my musical adventures over at Glacially Musical. So, in honor of my daughter’s getting older and more appreciative of fried fish, I will now be adding E-J’s take on what we eat. Please understand, she’s only three, so it’s very likely I’m going to have to do some interpretation here. 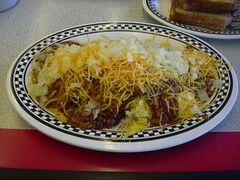 Welcome to the first collaboration post in the slinger category. My good friend Joe decided that after sending me many pictures of slingers he wanted to go get one with me, and I needed work done on my car anyway…so here we are! Joe: T.J.’s Diner is where I go when I’m too lazy to leave my South County neighborhood and drive (all the way) into the city to a Courtesy Diner. 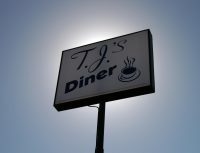 Tucked away on Baptist Church Road in a building that looks like it may have been a Captain D’s or Long John Silver’s in a past life, you could drive right by T.J.’s Diner in South County and not even know you passed it. The signage is very high up and hard to spot from the street. But we locals know it’s there and the place is packed on Saturday and Sunday mornings. Another Friday full of fish adventures has come and gone. It’s amazing how many little things can go right or wrong and change a trip on the fly. This past weekend our chosen destination was St. Matthias in South County. Having filled the car, as usual, with three generations of our family, the Honda Civic was pointed south. Out of St. Louis City we went and into the wilds of South County all the while listening to music and Siri’s directions on how to get where we were going. As we passed down the road, United Methodist was on our right and jokingly I said, want to stop here to get fish instead? A good laugh was h ad by all as we kept chugging along down south. Upon arrival at St. Matthias, a sadness overtook me, as there were nearly zero cars in the parking lot. This is never good at 5:45pm on a Fish Fryday. I rolled down the window to smell, and there was no smell of fish! 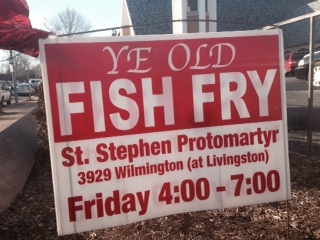 We then checked the sign and saw that there was no fish fry today. At least the car wasn’t emptied and we could just turn around and head to that place down the road. When beginning the post on this one, the last Friday in Lent before Good Friday it was hard to believe that this was only third post of this season. This is one of my favorite times of the year and my family loves going out for fish on Friday nights. So, this year was a bit disappointing that we have missed a couple. I may have to do something special to make up for that. This is the first year of our travels were we didn’t create a week by week schedule two or three weeks before Lent started, so we’ve often times been at a loss this year when Friday rolled around, but I feel like we’re still doing well and going to places we’ve never visited, which is nice. We also had our first Fish Fail to go with the five or six slinger fails. All in all, aside from the plague that befell us, it’s been a pretty fun year, but my daughter now being old enough to say fish is yummy in my tummy as she eats it certainly helps! 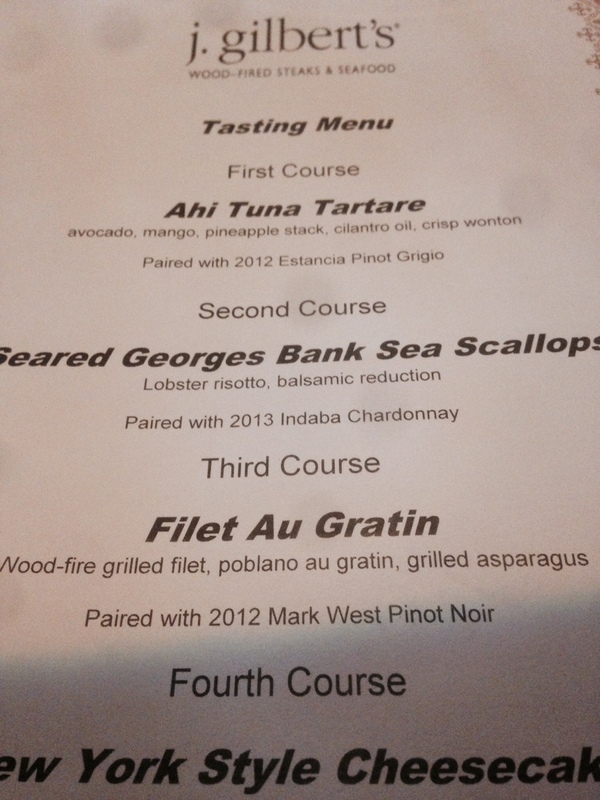 Fish Frydays 2013 #2: Well………….about that. Let’s get our fish on. Now, let’s get to the fish story. 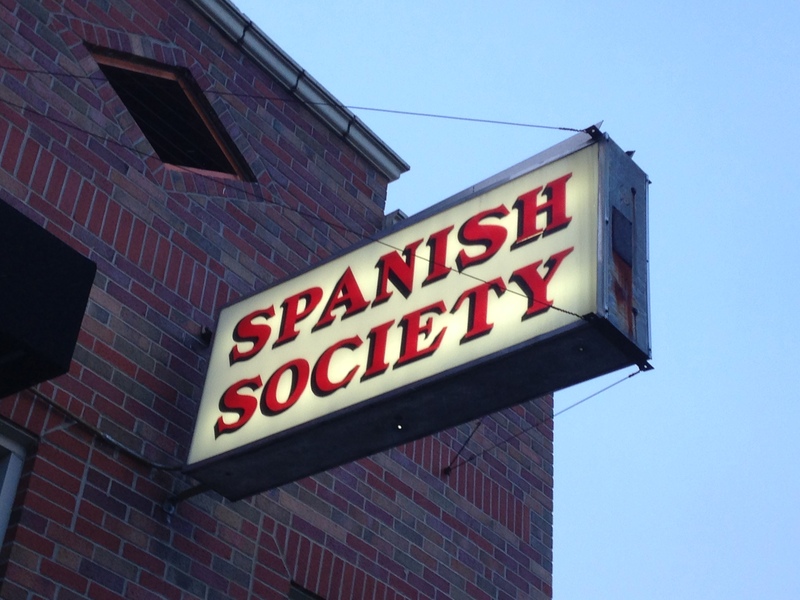 We had chosen to head over to the St. Louis Spanish Society for this week’s fish fry. I had an errand to run and I ended up at the place well before anyone else had arrived. I walked to the back and fantasies of speaking Spanish during my fish fry ran through my head. Apologizing for speaking a different dialect, oh the fun I’d have. Posted: March 12, 2013 in What the hell? 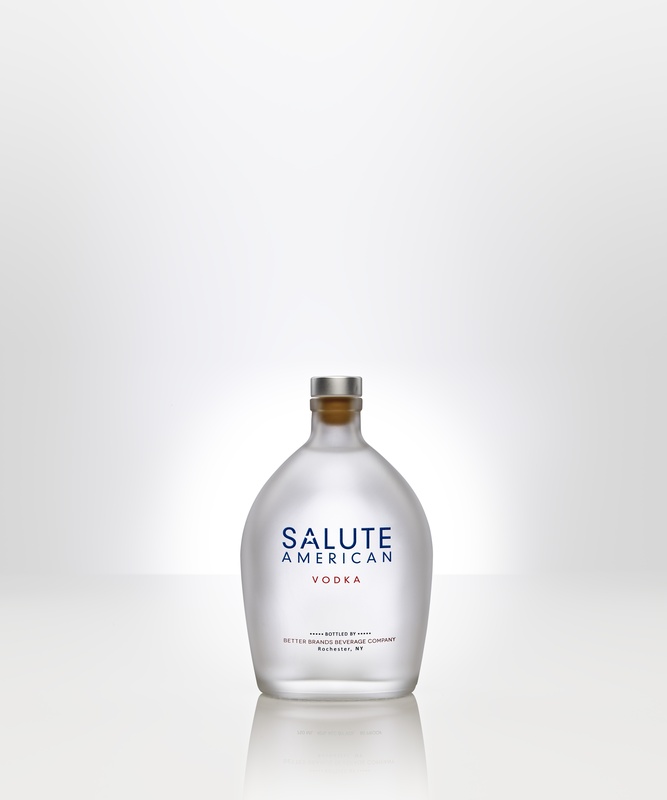 Awhile back an email arrived to me asking if I would be interested in checking out a new vodka called Salute American. Needless to say, this was a very surprising email. As has been well documented, I’m not really a vodka drinker. I believe that most people would know that I drink bourbon. I drink Scotch. And I drink beer. Hmm. I think I should write a song about that. In fact, when I told my wife I was doing this post, she said what do you know about vodka? Me? not a whole to be perfectly honest, but I know what I like, but there was a time in the past when I drank a fair number of martinis and I definitely enjoy a spicy bloody mary from time to time. 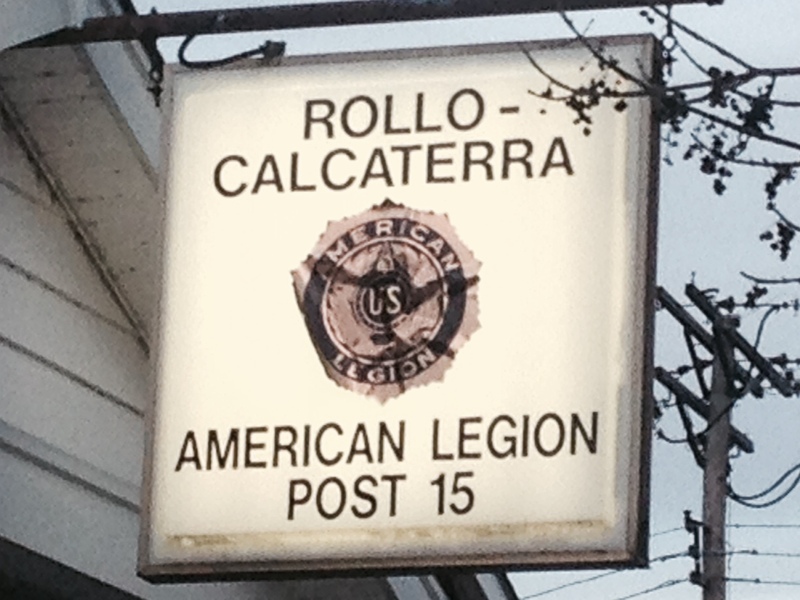 What struck me about this group is that they are donating proceeds to causes that support returning veterans. This is something that is very near and dear to me. One of my closest friends, is a two time combat veteran who just returned home from Afghanistan last month. You may have read my being a bit weepy about it on twitter..sorry for any embarrassing drunk tweets but we drank a lot.